Vollrath 72171 Colonial Antique Copper Kettle Soup Warmer / Merchandiser 7 Qt. TigerChef > Restaurant Equipment > Food Warming and Holding Equipment > Commercial Food Warmers >< Soup Kettles > Vollrath 72171 Colonial Antique Copper Kettle Soup Warmer / Merchandiser 7 Qt. Attractive and functional, the Vollrath 72171 Colonial Antique Copper Kettle Soup Warmer / Merchandiser 7 Qt. 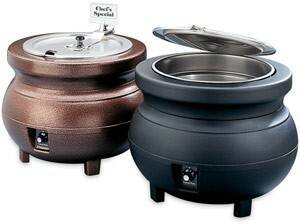 will keep soups, stews and other specialty dishes hot and ready to serve. This product features an epoxy-coated cast aluminum body which distributes heat evenly and boasts a traditional look that will enhance any presentation. Perfect for store displays, buffets, and salad stations, this piece has a low profile design which makes it easy for guests to access the food. This item is also equipped with a hinged lid to keep the heat in while protecting the stored food from airborne contaminants. For quick temperature adjustment, this catering essential has controls conveniently recessed to prevent guests from accidentally changing the heat setting. A breeze to set up, this kettle soup warmer and merchandiser has four sturdy legs for stability and easy placement, and is a great option for fast-paced food service facilities.